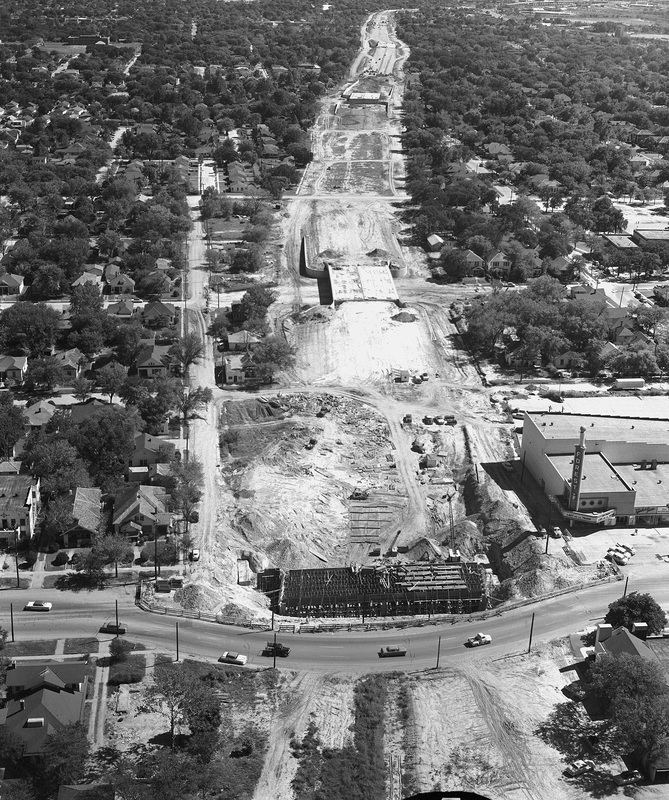 Behold, a photo of South Dallas on Sept. 29, 1955, showing a lengthy stretch of bulldozed land cleared for the imminent construction of South Central Expressway. We’re looking south, with Forest Avenue (now Martin Luther King Blvd.) running horizontally in the foreground. To the right is the Forest Theater (now playing: “Lady and the Tramp”). And if you zoom in, you can just see the post-Ross Avenue location of the famed Jim Beck recording studio to the right of the theater. This great swath of land cut through an established tree-filled residential area — it ran alongside the once-swanky Colonial Hill neighborhood. Zoom in and take a last look at some of those straggler houses that haven’t yet met their maker. …But they will. …And they did. I wondered what had been demolished on Forest between the houses to the left and the theater to the right. It was Fire Station No. 6, at 2202 Forest Avenue. I looked in my bulging file of miscellaneous photos and was surprised to actually find a couple of photos of that No. 6 Engine Company, which was built in 1913. 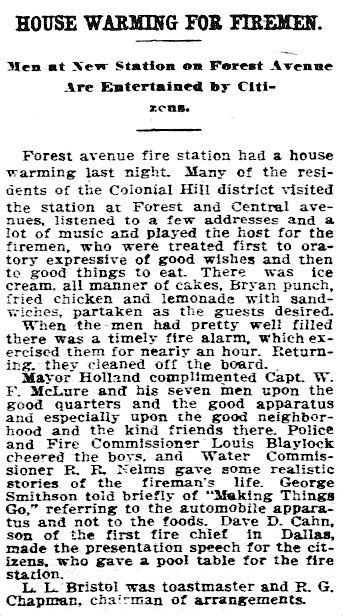 The station was on the south side of Forest Avenue, alone in a very short block. As we look at the station in the photo above, the H&TC railroad runs just to the right of the station, and Kimble Street runs along the left. 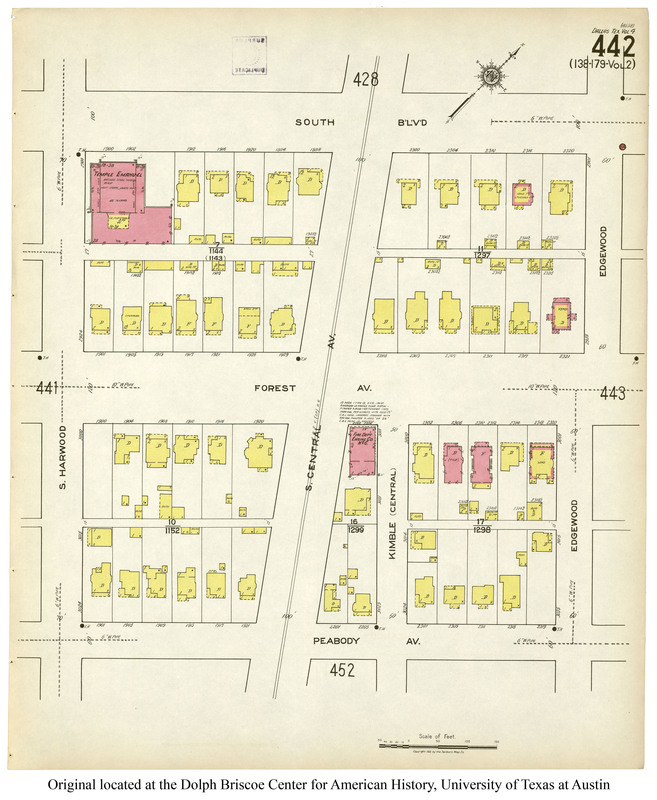 See a Sanborn map of this area in 1922, here. The photo below shows what Forest Avenue once looked like, from the front of the firehouse looking east (the intersection with Kimble is on the other side of the firetruck — you can see the street sign). These houses are still standing in the 1955 photo at the top. When you know what this intersection looks like today (see this same view today, here), it’s hard to believe it ever looked like a cozy neighborhood. Progress is a helluva thing, man. Top photo by Squire Haskins, from the Squire Haskins Photography, Inc. Collection, UTA Libraries, Special Collections, University of Texas at Arlington; it is accessible here. 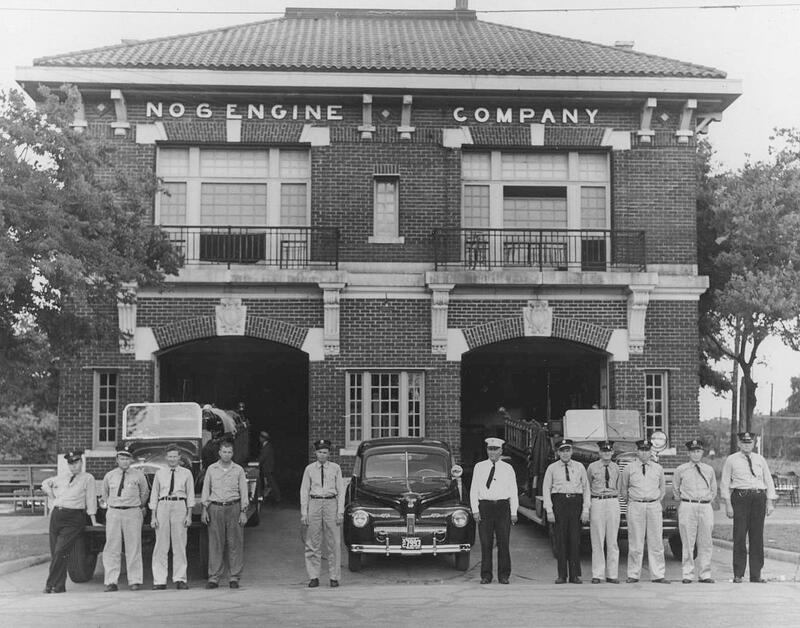 The two fire station photos are from the collection of the Dallas Firefighters Museum, via the Portal to Texas History, University of North Texas. The first photo can be viewed here, the second photo here. See an aerial photo of the same view seen in the photo at the top here. 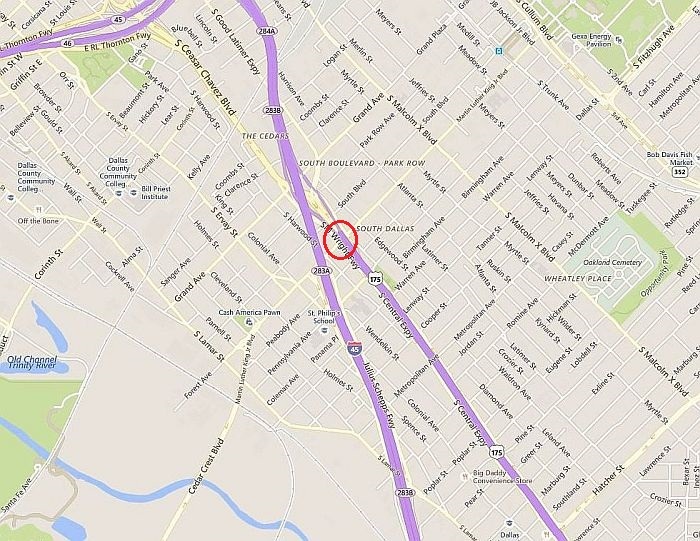 The Forest Theater is at the bottom, between the forks of S. Central Expressay on the left, and I-45 on the right. Photos and clippings larger when clicked. What great photographs, from a variety of sources! What great, sad photographs. I was raised in an area that is now only as old as I am. Prior to us moving into a brand new house, one of the first in a brand new planned community, the land being developed was virgin and native. We watched the neighborhood, and later the city, grow up and thrive. I know ALL of the history of that place, with the exception of the times the nomadic native tribes claimed it. Coming to Dallas, I am delighted by the history of things here. To walk in a neighborhood, on original sidewalks that are lined with trees at least twice my age. To learn that some place that is old and historical wasn’t the first there, and the spot had a prior life perhaps as colorful as the existing. My parents married in Missouri in Dec. 1954 and immediately came to Dallas. They stay here for a year and a half, while dad went to school for electrical engineering, which was provided by the military after serving in Korea. They first lived on Haskell, at San Jacinto, I think. In a tiny house situated in the backyard of a much bigger house (neither are still there). She often speaks dreamily of their Dallas days. The Rexall Drugs on the corner there where they would walk to get a soda after he got home from class. The time she had to bravely walk the streets of Dallas to go to downtown to pay a bill. It seemed so far then, she said, but now that area seems like an extension of down town. This post is particularly exciting because it happened exactly at the same time they were here, so thank you for that! The car in front of the station is a Ford of the war-shortened 1942 model year, and the license plate is, I think, 1946. 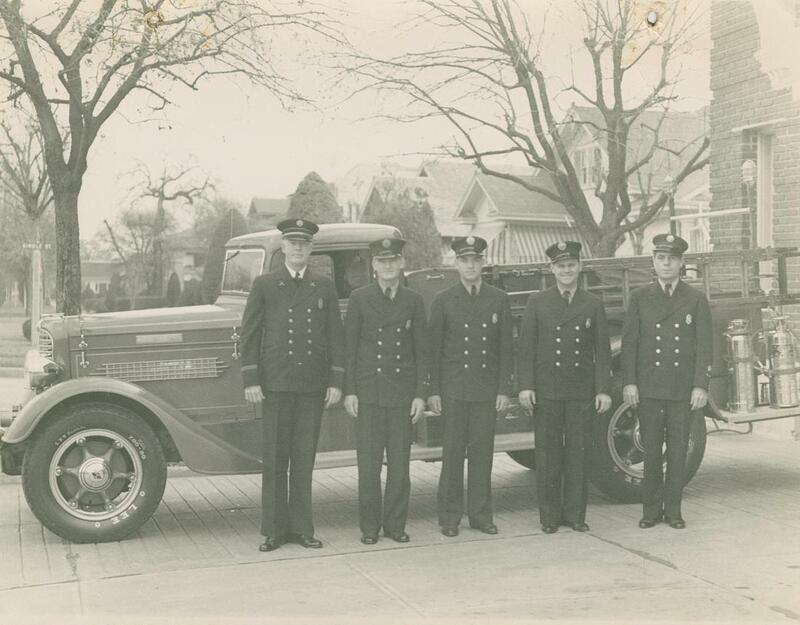 The paint on most four-year-old cars in those days didn’t look this good, but fire departments have traditionally been careful with their equipment. Nice picture.